Rock, the world&#8217;s lingua franca? Speak easy: Neither English nor rock are common denominators. Rock, the world’s lingua franca? Anyway, Bob Geldof, knighted by Queen Elizabeth II in 1986 for his work as a singer, songwriter and political activist, became the only musician to be asked to speak at the annual HT Summit this year. And don’t any of you tell me you haven’t heard of him. That’s sheer nonsense. And so what if you haven’t heard of him? Go on yaar, just Wiki him and you’ll get all the information you could want. Seriously, guys, don’t you remember his work with Band Aid, Live Aid, and Live 8? No? Well, what else could you expect of a nation that’s busy with serious stuff like Nach Baliye 3, Indian Idol, Sa Re Ga Ma Pa and Voice of India? Seriously, I’m really happy that a musician was invited to the Summit, which has hitherto been blithely oblivious of the need for any discussion on the arts. That Bob Geldof spoke of “Using Culture to Influence Global Priorities" is yet another reason to celebrate. And yet there are several questions that crop up in my mind. Geldof is reported to have said that rock music, not English, is the lingua franca of this planet. Sir Bob, I beg to differ. Neither English nor rock music can ever be the lingua franca of this planet. Because unless the sheer variety and diversity on this planet is wilfully destroyed, people will continue to speak different languages, follow diverse customs and rituals, and make different kinds of music, even if you do not recognize or acknowledge their worth. It would be pertinent to refer here to the criticism levelled against Bob Geldof for not including African music and performers in his Live 8 project. 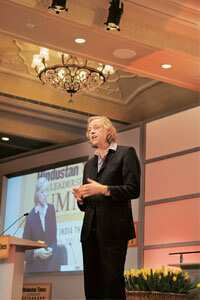 Geldof fielded the accusation by declaring that African music did not command the same worldwide attention as best-selling acts from the West. Their inclusion, therefore, “would have undermined the effect of the concert". I doubt that anyone at the Summit questioned Geldof about his views on these matters because, finally, the whole event seemed to be more of an unplugged version of a chat show. Everyone looked good, chatted politely and comfortably, making sure not to discuss anything threadbare. And that’s a relief. We can all go back to our current obsession with the next talent hunt, even if the winners won’t be a part of Geldof’s line-up for his next big charity.